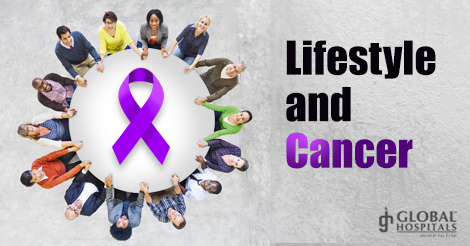 Lifestyle and cancer, in what way are both related, you may be wondering? Well, they are related. Cancer is one disease for which we say all the things under the sun including the sun is the cause. Why not Lifestyle? Let us see how they are related. By Lifestyle I mean what diet we are going to consume, what kind of life we are going to lead, what are our habits, what are our social and moral values, how much physical activity we indulge in, and all these factors put together have an effect on our health and disease. Our elders always keep saying that they did not have these many cancers in their times and now they see increase in the cancers. Partly it is true, these lifestyle changes have definitely contributed to increase in some cancers, at the same time decrease in others. Firstly, let us look at the diet we consume. Vegetarian diet, diet rich in fresh green vegetables and fruits are always rich in fibers and antioxidants like carotenoids and vitamins which have protective action against cancer. High fibre diet is protective against Colonic cancer. The modern lifestyle makes the people eat junk food, refined food which lack natural fibres. Consumption of lot of red meat along with this also predisposes a person for colonic cancer. Among various risk factors put forward for breast cancer, high fat diet is one. Due to improved education and earning capacity, there is a change towards affluent lifestyle among women, there is increased consumption of high fat diet. High fat diets during the pubertal age and obesity in the post menopausal age are risk factors for breast cancer. Diet rich in legumes like soya and peas are protective as they are rich source of phytoestrogens against both breast and prostate cancer. Physical activity again has a protective action against breast cancer. Affluency has also made many women accustomed to sedentary lifestyle, spending more and more time in front of computers and television and hence at higher risk of developing breast cancer. Early age of marriage, early sexual activity, early child birth are all risk factors for cervical cancer, the opposite of it, that is late marriage, nulliparity, late childbirth are risk factors for breast cancer. Due to urbanization and westernization, improved literacy and better standard of living, more and more women are getting married at a late age, they also have child at later age mostly single child, and so the cervical cancer is on the decline and breast cancer is on the increase. Not only change in social status of women but also screening for early disease in asymptomatic women and its awareness has brought down cervical cancer. But change in moral values have lead to more promiscuous behavior among modern young women which may again bring back cervical cancer to forefront since it is considered a sexually transmitted disease. Our habits also contribute to increase in cancer. Tobacco is a bigger menace in the society. Tobacco in the form of cigarettes, cigars or oral preparations like Gutka is attracting our younger generations both male and female alike. It is a known evil for head and neck cancers and lung cancers. It is considered as a social status among young men and women to show their maturity, independence and heroism. Tobacco in any disguise is dangerous. Because of its harmful effects we are seeing more and more young men and women in their early twenties and thirties succumbing to head and neck cancers. Lung cancer is on the rise among women due to increased smoking prevalence among them. Tobacco is implicated in most of the cancers including cervical cancer, urinary bladder cancer gastro esophageal cancer etc. Alcohol intake added to tobacco increases the person susceptible to gastro esophageal and liver cancers. Drug addiction among young people, use of same needles by all has disposed them to diseases like Hepatitis C and HIV which predisposes them to liver cancer and decreased immunity to many other cancers like lymphomas. Now we understand why our ancestors were healthier, because they lived a life of physical activity, good healthy diet, life of moral values, and stress free life. So it is essential for us also to follow footsteps of our elders to keep healthy and away from cancer.